After Flamboyant Shoes Guy called out the phenomenon, I found 15 accounts (please don’t abuse them — they get enough of that already). All with “Amazon smiles” as their backgrounds and several with animals as profile pictures. All have the same bio structure: “(Job titles) @(warehouse shorthand location). (Duration) Amazonian. (2- or 3-item list of things they like. )” All have “FC Ambassador” in their name. All have links to an Amazon warehouse tour service. The workers say that they don’t receive compensation for being ambassadors; it’s a “totally optional role” they have taken on voluntarily (Update: it’s a bit more complicated than that — see below). They also claim to be warehouse employees in the ordinary sense. If so, they’re putting their numbers at risk by taking the time out to bang out long tweets hourly on how great they’re doing. I have a friend who worked as a picker for a while, admittedly some years back. He said it was some of the most mind-numbing yet physically demanding work he’s ever done. I understand that some folks may just be happy to have a job with full pay and benefits — I’d never begrudge anyone that — but the unanimous and highly stilted positivity on display in these ambassador accounts really seems like something else. The program just started a couple weeks back; there are apparently 14 total, not 15 — either I can’t count or I mistook an inactive or fake one for the real thing. Several have also disappeared from the original collection since last night. When I was there they just got an extra paid day off and a gift card after Peak [pre-holiday season]. This is what I got. A paid day off (that expired in 3 weeks lol) and a $50 Amazon gift card. Plus, they gave us lunch. Coldcuts and sandwich bread. I absolutely did not get paid more to train people. Ambassador isn’t a ‘job’ you do every day, its just something you are trained to do. You go to a 4 hour class and they teach you how to teach others to tie a knot using a set of instructions. This is how new hires a supposed to be taught. You are supposed to teach them right from a script using a set protocol. Becoming an ambassador was a way to get out of loading trucks, or packing boxes for 10 to 12 hrs. You may ambassador 1 day then unload trucks for the next 3. I stopped doing it after the first year I was there because it didn’t pay more. It’s voluntary. Your manager picks them. Generally speaking ambassadors are the “kiss asses” of the department. 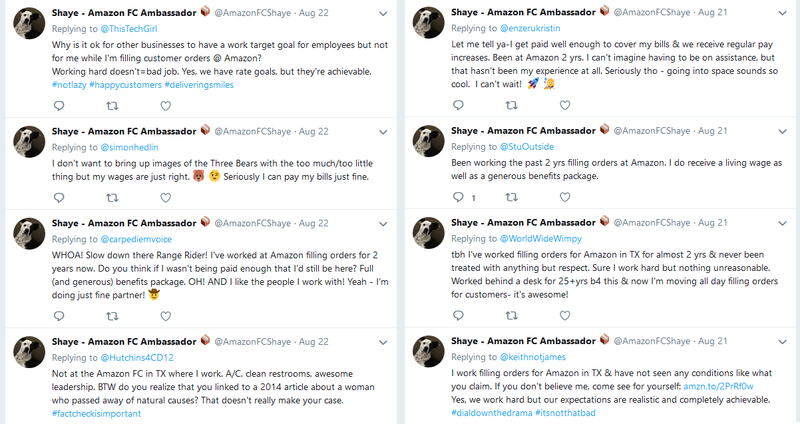 In case it isn’t obvious, Chris is no longer at Amazon and is happy to speak his mind. Thanks for helping us clear this up, Chris.